As featured in the Daily Express: New book details the lives of desperate Victorian women driven to crime and featured in the International Express on 4th May - full page article. You'll be £19.99 closer to your next £10.00 credit when you purchase Victorian Convicts. What's this? Order within the next 4 hours, 20 minutes to get your order processed the next working day! What was life like in the Victorian underworld – who were the criminals, what crimes did they commit, how did they come to a criminal career, and what happened to them after they were released from prison? 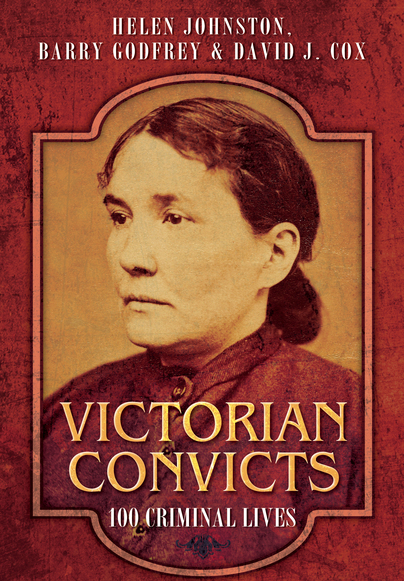 Victorian Convicts, by telling the stories of a hundred criminal men and women, gives the reader an insight into their families and social background, the conditions in which they lived, their relationships and working lives, and their offences. They reveal how these individuals were treated by the justice and penal system of 150 years ago, and how they were regarded by the wider world around them. Such a rare and authentic insight into life in and out of prison will be fascinating reading for anyone who is interested in the history of crime and criminals, in legal and prison history and in British society in the nineteenth century. Over the last ten years with programmes such as “Who Do You Think You Are?”, people are finding out they have a convict in the family from the Victorian era. The Victorian convict prison system came in to being in the 1850s, partly in response to the ending of transportation to Australia and other colonies were refusing to accept any British convicts. With a wonderful introduction to the Prison System of the time is enlightening and explains that 90 prisons were built for the new system and that this was because ‘penal servitude’ replaced transportation. Penal servitude in the English and Welsh legal system lasted for nearly 100 years and well in to the 20th century, something you will notice when reading newspapers of the time. There is also a clear explanation of what was then The Convict Licensing System, which helped the convict to earn their ‘ticket-of-leave’, somewhere between probation and the licensing parole system of today. With a clear explanation of how the system worked is enlightening otherwise things would seem rather confused to the lay person reading the records. There is also an explanation for those who are family historians on how you are able to use the licence folders in search of family and social history, which is very handy. With 100 convicts, they give the name of the convict, year and place of birth, and that person’s licence number. It then gives a picture of the convict’s life up until the point of conviction, what the conviction was and where they were charged and sometimes served their time. If what happened to the convict is known once they are released that is added to further to illustrate the life. One of my favourite outlines is that for John Fletcher, born in Manchester in 1836 and had served time in several prisons before being sentenced for penal servitude in 1867, which he got to do in Gibraltar rather than in England. Or that of Margaret Donovan, from London, who got to appear at the Central Criminal Court, the Old Bailey, and she got to serve her sentence at Millbank Prison, London. An excellent book, full of interest and a source of advice for those who want to learn more about Victorian criminals and their crimes. A well written, well researched social history of a time long since forgotten. This is a far more interesting book than the title and subheading may first appear to the general or specialist reader. In fact it is intriguing and very readable opening a window into lives of so many unfortunates. If you have an interest in police history this work, particularly details of numerous convictions and what followed after the court case was concluded will be of interest. Superb book with lots of interesting true stories on convicts past. Great photos as well, recommended! ...A fascinating, informative and educational read providing the history of these one hundred individuals who lived so long ago but who can teach us today the practices of the Victorian penal system and the struggles of the era. We often forget about history and those who have gone before us. This book ensures for these one hundred Victorian criminals at least, their stories and their existence, will not be forgotten. Intriguing and very readable opening a window into the lives of so many unfortuantes. If you have any interest in police history this work, particularly details of numerous convictions and what followed after the court case was concluded will be of interest. Meticulous research some cases reveal what happened to the prisoner once released and if they then behaved or returned to their former patterns of behaviour. An interesting introduction to Victorian crimes, the people who committed them, and how effective rehabilitation may have been. Dr Helen Johnston is Senior Lecturer in Criminology at the University of Hull. Among her publications are Crime in England, 1815-1880 and Punishment and Control in Historical Perspective.